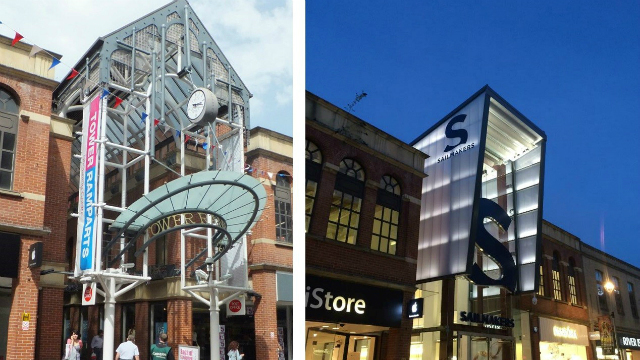 DLG’s involvement with Tower Ramparts Shopping Centre goes back some 20 years, initially working with the previous owners to simplify some of the 80’s interiors. Although located in the heart of Ipswich’s historic centre and connecting the town’s main bus station to one of the main shopping streets, twenty years on the centre was failing to attract enough permanent and recognisable tenants made worse by the departure of the anchor department store which had been the focus of the centre. LaSalle Investment Management bought the centre four years ago with a view to turn around its fortunes with a phased investment to refurbish and improve the centre. Our involvement this time round started with the subdivision of the former department store to bring in new tenants into the centre, and earlier this year works started to remodel the entrances and fully refurbish the interior. Works are now near complete following an intensive program of works carried out by Barnes construction. The process began with the development of a new brand and name for the centre created by NextBigThing branding consultants. The centre was to be renamed Sailmakers and its new brand was to build on the towns maritime heritage as a major centre for sail fabrication with the architecture and interiors to focus on a language of the docks of Ipswich. The centre suffered from poor visibility from within the town with only a small entrance facing Tavern Street, one of the main shopping streets in the town which failed to read as a clear and welcoming entrance to a shopping centre. Although on a much larger scale the other entrance facing the towns bus station suffered from similar problems of poor legibility. 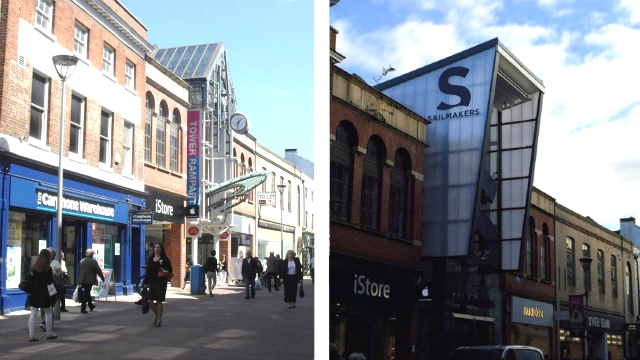 The concept for the new entrances built on the sailmaking theme where we designed a canopy formed by two translucent sails which projected far out into the high street giving the centre a much bolder and clearer presence on the high street. Although a challenge at first, we were able to convince the council to accept the larger scale of the canopy in this historic setting which has greatly improved the visibility of the centre along Tavern street . The sails are made from translucent polycarbonate sheets on a steel frame and hang off a chunky rust coloured portal frame recalling the architecture and form of the docks. At night the entrances come alive with uplighting to the polycarbonate cladding making the sails glow.